Ice cream is a frozen soft food made from sweetened and flavored milk fat. It is often combined with a variety of ingredients to produce different flavors. Ice cream products can also be categorized into products such as frozen yogurt, sorbet, frozen custard and gelato. Virtually all of the ice cream utilizes additional sweeteners, from natural sugars to artificial sweeteners. In the US, the ice cream is generally composed of 12 to 16% sweeteners and usually with a combination of sucrose and glucose-based corn syrup sweeteners. Other commonly utilized artificial sweeteners are Aspartame, Sucralose, Stevia, Maltitol and Xylitol. The general purpose for artificial sweeteners is to provide alternatives to individuals who are affected by high blood sugar conditions and those who would like a reduced calorie food. Energy uplift. Ice cream is an excellent source of carbohydrates with about 10-20 grams of sugar per half-cup serving. Each serving also contains about 6-10 grams of fat and 2-4 grams of protein, generally totaling in about 150 kilo-calories of energy, which is significantly more than a cup of whole milk. Minerals. Ice cream is especially rich in minerals such as calcium, phosphorus, iodine, magnesium, potassium and zinc. One half-cup of the product delivers about 6-12% RDA of some of the most bioavailable minerals such as calcium and phosphorus. Vitamins. Ice cream is rich in fat soluble vitamins such as vitamin A, D, E, and K. It also provides water soluble vitamins from the vitamin B group including vitamin B12, Thiamin (B1), riboflavin (B2), Niacin (B3) and folate (B9). The cream also provides vitamin C.
While modest amounts of ice cream consumed on occasions is great for the body and spirit, daily consumption of moderate amounts of ice cream can lead to adverse health conditions. Fats are the primary ingredient of ice cream. Since the ice cream is made from milk, the fat content is mostly cholesterol and saturated fat. While a human body needs healthy amounts of these two components, excessive fat intake may eventually increase blood cholesterol, increasing a change of a plaque build up in arteries. Arterial plaque increases blood pressure and restricts a proper blood flow to all organs in the body. Sugar content in ice cream is generally high; about 10-20 grams per 100 grams of ice cream. Daily consumption of sugars in high amounts, contributes to weight gain, increase in blood sugar and often increase in abnormal insulin hormone fluctuations. Frequent insulin spikes can lead to reduced immunity, increase in recurrences of bacterial infections and reactivation of viral infections such as herpes simplex group that causes cold sores, genital HSV, herpes zoster that causes shingles and EBV that is implicated in a chronic fatigue syndrome. Invoking insulin spikes can also eventually lead to diabetes type II. 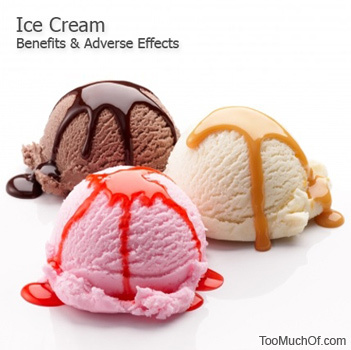 Lactose content in ice cream can cause issues for those who are lactose intolerant. Taking “lactase”, an enzyme needed to digest the milk products may alleviate the lactose intolerance, however, it will not eliminate all of the adverse effects from eating the lactose content. Another alternative would be consuming an ice cream made from a dairy substitute. A calcium excess is a rare occurrence when consumed from dietary sources in healthy individuals. However, those who are affected by an imbalance in calcium metabolism caused by an abnormal levels of vitamins A, D, K, imbalance of minerals and hyperparathyroid, a hypercalcemia can frequently occur resulting in the abovementioned symptoms. Complications of hypercalcemia are often presented as pancreatitis, peptic ulcer disease, calcium deposits in the kidney, high blood pressure, kidney stones, difficulty concentrating or thinking and osteoporosis. Aldehyde C-17 – a flavoring agent for cherry ice cream. Also used in dyes, plastics, and rubber. While a modest consumption of commercially produced ice cream should present no dangers to healthy individuals, those who are affected by digestive issues or improper calcium metabolism are advised to produce a home made ice cream, avoiding excessive sugars, fat content and additives. Healthy individuals should consume commercially produced ice cream on occasions and not to make it a staple in their current diet. It is advised to eat ice cream and other products containing simple sugars after meals and not on an empty stomach. This will allow to reduce a rapid absorption of simple carbohydrates in the blood stream, which puts a significant strain on pancreas, increasing a chance of developing a pancreatic dysfunction. Pancreatic dysfunctions are often expressed as diabetes and hypoglycemia.